Hello, I am back today with another card for the Coffee Loving Cardmakers Spring/Summer Blog Hop. I look forward to these each season, there are so many different styles to get inspired by…Fun, fun, fun!!! I started with a fun layered background. First I put Distress Inks in Picked Raspberry, Squeezed Lemonade and Spiced Marmalade onto my craft mat and spritzed it very generously with water. I then took a piece of watercolor paper and smooshed it into the inks, drying and redipping the paper until I was happy with what I had. 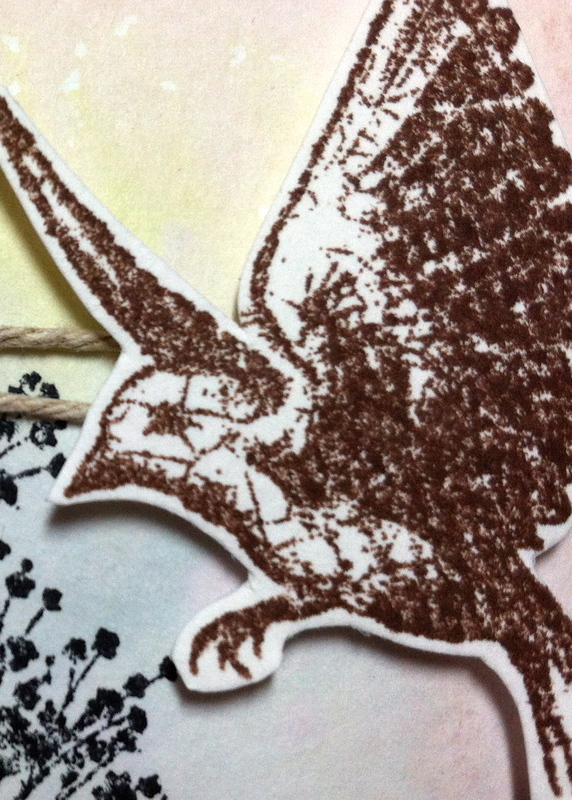 Then I used two separate background stamps, one with a dominant design and the other with a less dominant design. They were both stamped in Slate Gray ink from Close To My Heart. I had taken a background layering class with my friend Andi at a previous Scrapbook Expo and I learned a lot in that class, I hope it shows. 🙂 The background stamps I used in my card are from JustRite. They make huge background stamps, so you can orient it onto your card for either portrait or landscape designs. Next up, I die cut the To-Go coffee cup using a die I won in a grab bag, but I think it is Hero Arts…do not hold me to it though, it was eons ago. I stamped the cup sleeve with “a latte” and distressed the edges a bit with Hickory Smoke Distress Ink to make it stand out. I sponged that onto the lid as well to give it a bit of depth and definition. I stamped the Birthday Wishes sentiment in Worn Lipstick Distress Oxide Ink and clear heat embossed it. That stamp set is from a retired CTMH set. I cut it out and popped it up with foam squares. 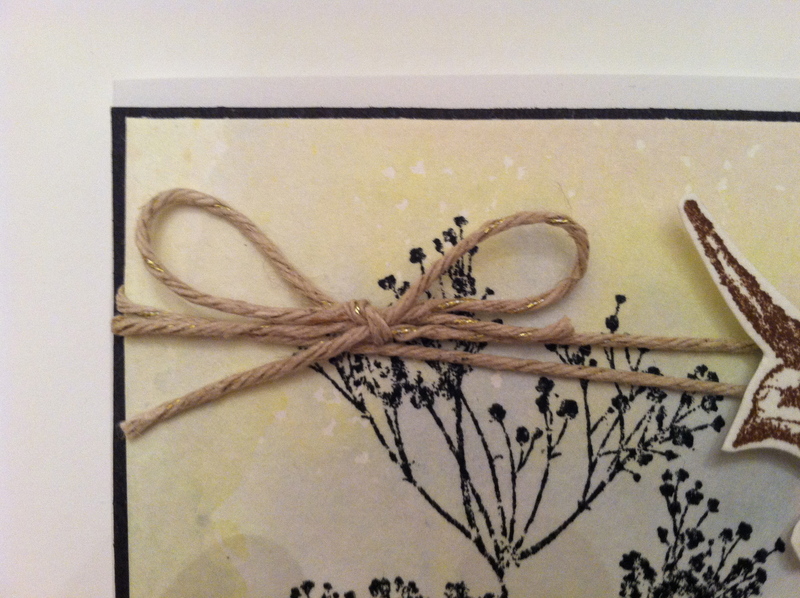 I wrapped American Crafts twine around the base and mounted that onto black cardstock, then onto the white card base. Well, thank you for stopping by and if you have not been to the Coffee Loving Cardmakers Blog Hop yet, please pop over there by clicking Here and get inspired and join in the fun! As always, we would love it if you would follow our blog by clicking on the “Follow Me” button and Like us on Facebook and follow us on Instagram so you don’t miss a thing. Thanks for stopping by! Hello everyone, today I am wrapping up my Thanksgiving cards. I cannot believe it is this week already. It has been unseasonably warm here in my neck of the woods, so that means the holidays are sneaking up on me more than usual! 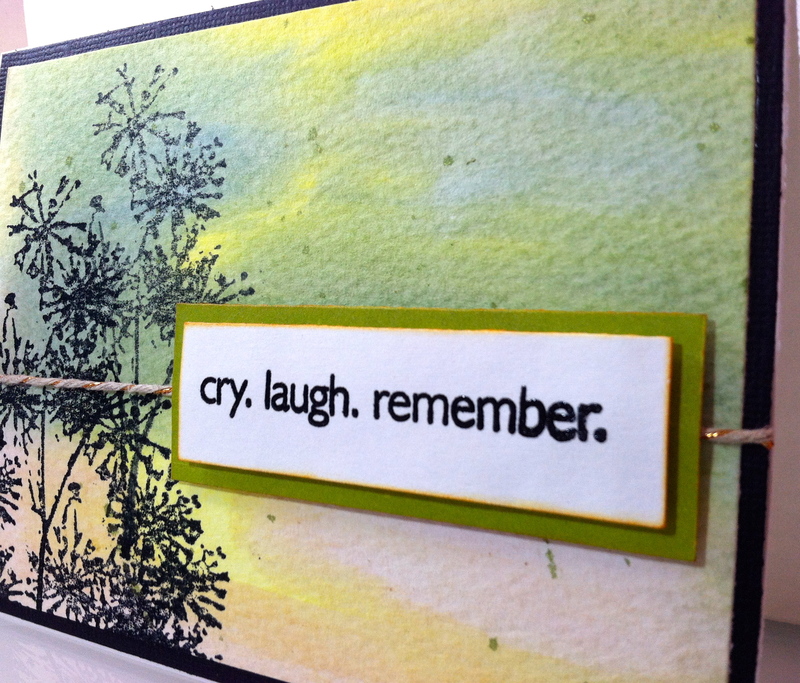 My card today uses the Falling For You stamp set by Newton’s Nook. The moment I saw this set, I had to have it. I did mask off the very beginning of the sentiment so I could add my ‘Always Grateful For’ which I pulled from CTMH Always Grateful stamp set. 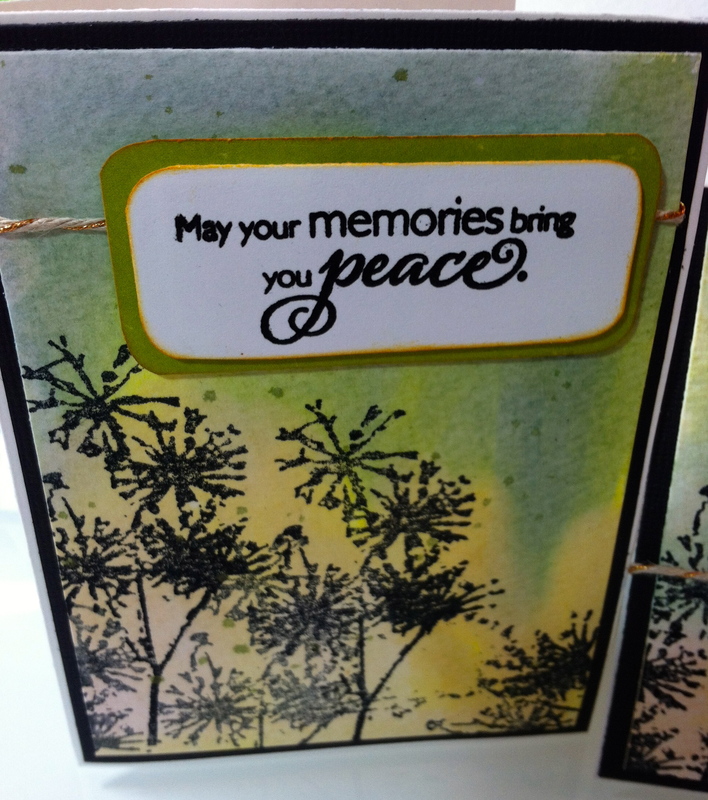 I stamped the sentiment with Versamark ink on watercolor paper and used white embossing powder. Then I smooshed Distress Inks in Peeled Paint, Squeezed Lemonade, Spiced Marmalade and Walnut Stain, spritzed it liberally with water and smooshed away! This is a messy but fun technique and one I use quite often…I thought I invented it, then I saw people use it on YouTube, so I guess it wasn’t such a unique idea. HA! Finally I spattered some more Spiced Marmalade. The card base is Doodlebug Designs Flea Market line, I saw all the adorable critters and one of the papers has a sunflower pattern, so it was a must have. The ‘Always Grateful For’ part of the card was gold embossed onto a strip of plain vellum, and wrapped along the top of the main sentiment. I hope you enjoyed today’s card. I would like to wish you and your loved ones a blessed Thanksgiving. Greetings friends. Today’s post is a bit more serious. I have had to make quite a few sympathy cards lately, and I am sure I am not the only one that feels these are by far the most difficult to create. Never-the-less it must be done. 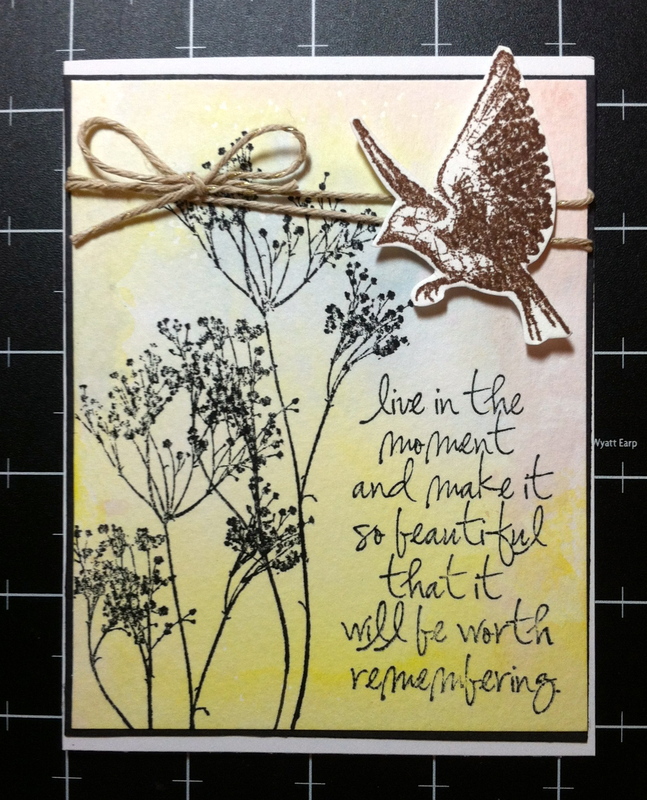 I have a go-to set of items for just this occasion, and those are; a Tim Holtz stamp set (Stampers Anonymous – Nature’s Moments), Close To My Heart – Big Hug and Distress stains or markers. Ingredients for the sympathy cards. I applied the stain a little differently this time. I took the Squeezed Lemonade and rolled it directly onto the watercolor paper. I randomly covered about 75% of the paper. Next I applied the Milled Lavender to the paper, covering about half randomly, some overlapping the yellow, some on bare paper. The last stain I added was Weathered Wood and I randomly added this to half the paper, filling in any bare spots and overlapping both the yellow and the lavender in a few spots. Finally I took a small paint brush and dipped it into my Heidi Swapp Chartreuse Color Shine (it has some metallic properties to it that give it a bit of a shimmer). I flicked the paint brush to create a random splatter of tiny drops. I have to confess, all my Color Shines are clogged and won’t spritz directly from the container anymore 😦 so my next project is to research how to get these babies working again! Once the stain and paints dry I added the seeding dandelion stamp using Memento Tuxedo Black ink and stamping it twice per inking to get the faded plants that look like they are in the background. Finally, I mounted them on black card stock, added a length of twine and topped them off with the mounted sentiment that is embossed and popped up with foam squares. Unfortunately, the embossing doesn’t show up in the pictures. 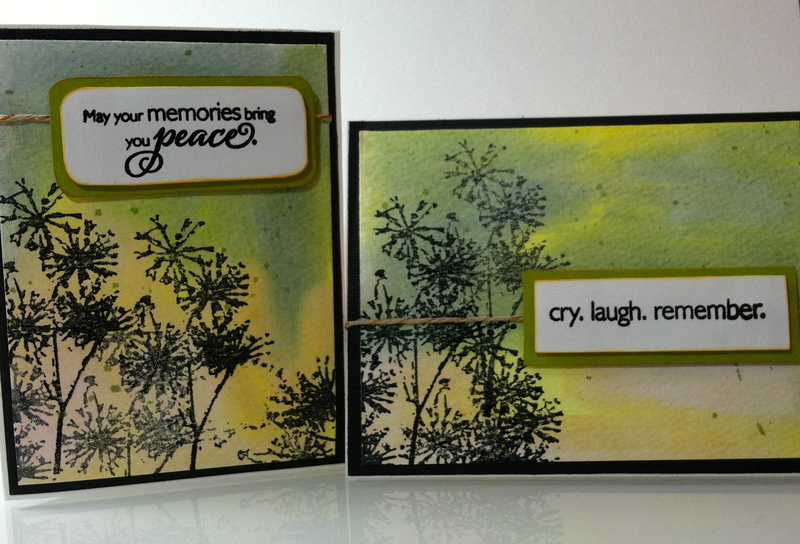 These are simple and this style can be adapted to any occasion, just by switching up the colors and stamps. Thank you for stopping by and please click the button on the left to follow our blog and Like us on Facebook, so you don’t miss a thing. Proof Positive That Albert Einstein Was No Crafter! Hi Tweety! Today’s project is a card I made recently for someone who was somewhat forced into retirement and I thought the sentiment was sweet and appropriate. 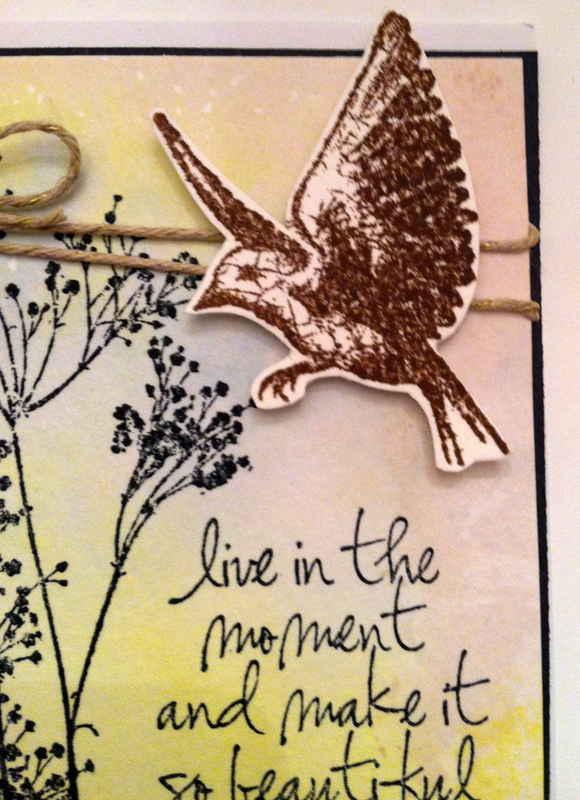 It is Nature’s Moments by Tim Holtz-Stampers Anonymous. The background was created on watercolor paper with Distress Stains. I used Spun Sugar, Salty Ocean and Squeezed Lemonade. For this technique I use a small piece of plexiglass as my “palette” and I roll the stains in a haphazard pattern onto the plexiglass. I then spritz with a bit of water and press the watercolor paper down onto the pooled water. I have used this technique in a previous post, but that one had a more antique look. Play around with various colors and you will see the different effects each combination has. One of the other great things about this technique is every outcome is different. Which dispels Einstein’s popular and funny theory, “Insanity: Doing the same thing over and over again and expecting different results.” He may have been a mathematical genius but he was no crafter! HA! 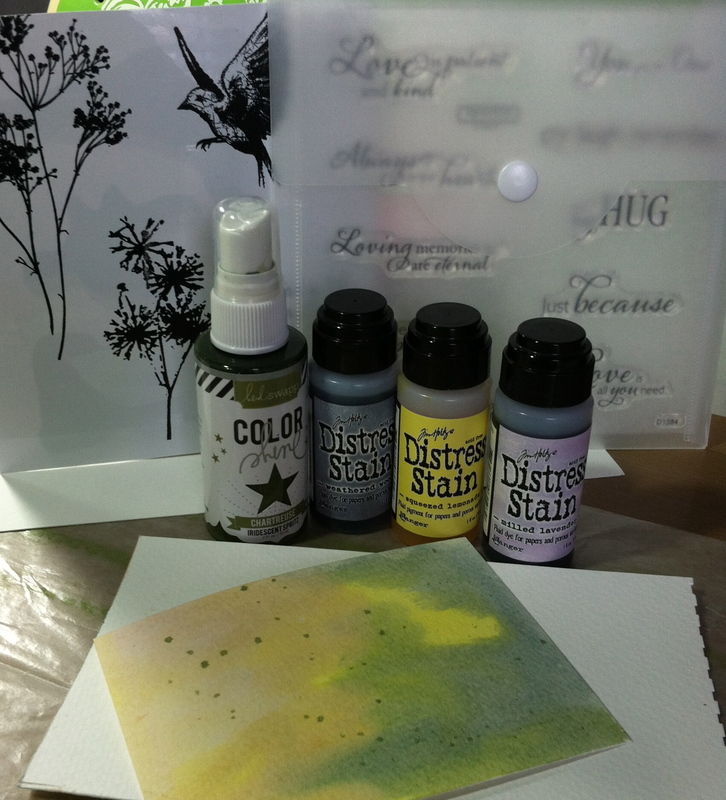 This stamp set is so versatile, I have used it for many different cards and the stained watercolor technique can be used in endless ways. I hope you try this technique soon!